It’s been awhile Trekkers, since I’ve graced the pages of the this dear website. You may remember me from last year, as I walked from Mexico to Canada on the Continental Divide Trail. Well, that didn’t kill me–in fact, it just confirmed that weird feeling that I somehow belong out there, so I’m moving on to the next trail, and I’m pretty stoked for this upcoming adventure. Mr. Muir, your mountains are calling and I must go! I’ve decided to hike the John Muir Trail! Starting in late June, I plan to walk from the southern terminus of the JMT on Mt. Whitney (the tallest mountain in the Continental US) to Yosemite National Park. A measly 220 miles, compared to my 2700 mile CDT adventure last year, but it won’t be without its challenges. The Sierras have gotten more than their fair share of snow this year. The passes will be snowy and the river crossings will be treacherous with spring run off, but I feel ready for this trek. Why the John Muir Trail? 1. I got lucky enough to score a lottery permit for Mt. Whitney. WOOT. The mountain gods were with me. 2. I can keep my job. After finishing the CDT, I pretty much ran out of money, and I currently can’t take off for another 5 month adventure to hike another long trail (THE TRIPLE CROWN TAUNTS ME)–at least for another couple years. The JMT is doable in 2 weeks. 3. I have never been in the Sierras before. Everyone I know who has walked through this area has nothing by wonderful things to say about it. I cannot wait to experience these mountains! 4. I’m actually in hiking shape? I’ve always been a firm believer that the only way to prep for a thru-hike is to thru hike. But since finishing the CDT, I’ve taken up Ultra Running. You know, those crazy people that run 30+ miles in the mountains at one time? Yeah, I guess that’s me now. (Don’t worry, thru-hiking will always be my first love.) It’s been a perfect way to keep me in the hiker frame of mind and keep my body strong through the winter. I’m ready to hit the ground running, so to speak. 5. I’m ready for a different kind of challenge. I’ve made some changes to my gear, my pack’s a little lighter, I’m in good shape, and I’m ready to go fast. I want to finish the JMT in 8 days. That would mean knocking off an average 27.5 miles/day. I honestly don’t know if that will be possible with the snow and river crossings. I’m open for changes in my plans, but I’m also ready to have some fun out there and give it the ol’ college try. Why travel northbound? Traditionally, the John Muir Trail is hiked southbound from Yosemite to Mt. Whitney, starting low and working your way up to Whitney. I’m looking forward to starting with the challenge of Whitney and ending my hike in Yosemite, where I can explore afterwards. Please follow along with me in the coming weeks, as I hike the John Muir Trail. Katie was born and raised in Connecticut, but now calls the great state of Utah her home. In 2009, Katie earned the trail name ‘Wilderness’ on the most poorly planned winter camping trip of all time. 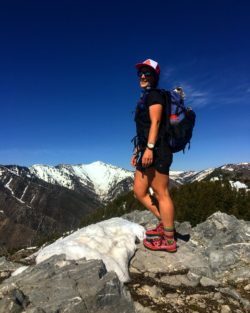 In 2015, Katie finished her 3-year section-hike of the Appalachian Trail, but she decided to just keep on walking because she was really good at it. Katie is a better dancer than Drake and has been told she has a nice smile. 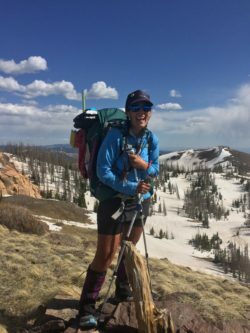 Katie finished her thru-hike of the CDT in September of 2016. 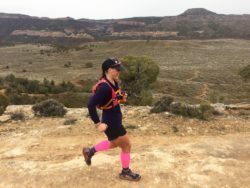 She plans to continue walking towards her Triple Crown, as well as every other long trail that exists in the coming years. Next up: the John Muir Trail. Starting from Yosemite next weekend – hopefully out paths cross. Awesome Andrew!! We’ll do a Hi-five as we pass each other!